Practice Computer Fundamentals questions and answers for interviews, campus placements, online tests, aptitude tests, quizzes and competitive exams. This set of Computer Fundamentals Multiple Choice Questions & Answers (MCQs) focuses on “Artificial Intelligence”. 1. The technology that has the ability to interact with the world. Explanation: AI which is artificial intelligence is the ability to interact with the world. It is the ability to model the world and to learn and adapt. 2. The goal of AI is to build systems that exhibit intelligent behavior. Explanation: The statement is true. There are 2 main goals in AI: to exhibit intelligent behavior and understand intelligence in order to model it. 3. The first neural network computer. Explanation: SNARC was the first neural network computer. it was built by Minsky and Edmonds in 1956. 4. A hardware based system that has autonomy, social ability and reactivity. Explanation: The answer is Autonomous Agent. Autonomous agent has autonomy i.e. ability to operate without the direct intervention of humans or others. 5. A particular system that contains intelligent agents. Explanation: It is called an agency. A particular system consisting of intelligent agents like computers or robots that cooperate to find the solution to a problem. 6. A methodology used to develop behavior-based autonomous agents. Explanation: The answer is behavior engineering. Autonomous agent implements autonomy, social ability and reactivity. 7. An international research effort to promote autonomous robots. Explanation: RoboCup is designed to promote autonomous robots. It is based on multi agent collaboration. 8. A type of non-monotonic reasoning. Explanation: Default reasoning is a type of non-monotonic reasoning. Default logic is a non-monotonic logic proposed by Raymond Reiter to formalize reasoning with default assumptions. 9. The performance of an agent can be improved based on this. Explanation: An AI system is designed to learn and improve. The same is implemented on its agents. Explanation: The answer is applied AI. It is based on applied artificial intelligence. It is an approach to develop commercially smart systems. 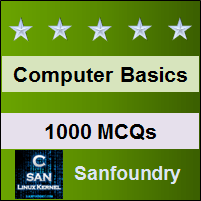 Sanfoundry Global Education & Learning Series – Computer Fundamentals. To practice all areas of Computer Fundamentals, here is complete set of 1000+ Multiple Choice Questions and Answers.